The inner surface Tygon® 3350 silicone tubing has been designed to reduce the risk of particle entrapment and microscopic build-up during fluid transfer. In-house analysis of the inner surface of Tygon® 3350 silicone tubing compared to other silicone tubing shows that it is up to three times smoother. In addition, when compared to stainless steel tubing, Tygon® 3350 tubing exhibits a smoother surface by a factor of up to 40. A smoother fluid path also helps to facilitate complete sanitation of a fluid transfer system. Even in repeat use applications, Tygon® 3350 silicone tubing may prevent residue build-up, aiding in complete cleaning and sterilization. Additionally, the smooth inner surface of the Tygon® 3350 silicone tubing improves fluid flow characteristics by reducing surface area. 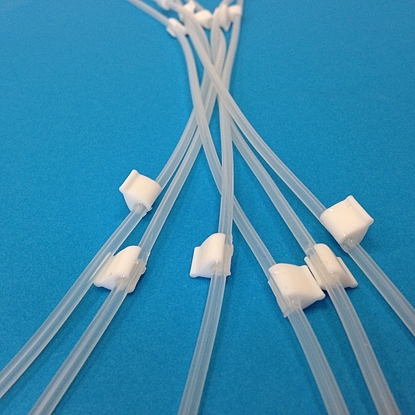 Tygon® 3350 silicone tubing is compounded to meet the most demanding requirements of biocompatibility. In-house extractability tests have shown that Tygon® 3350 silicone tubing has a low extractable content. Lower extractables help to maintain the purity of transported fluids in sensitive applications. Platinum-cured Tygon® 3350 silicone tubing complies fully with the requirements of the USP Class VI Criteria and is entirely non-toxic, non-hemolytic and non-pyrogenic. Additionally, Tygon® 3350 silicone tubing meets 3-A Sanitary Standards, FDA 21 CFR Part 177.2600 Criteria and NSF 51 Standard. Tygon® 3350 silicone tubing also complies with the ISO 10993 guidelines for contact with blood (or other body fluids and tissue) for up to 30 days as listed in the FDA GP-95. TYGON®-Schlauch 3350 3703208 schwarz-schwarz 0.76 0.85 2 6 St.
TYGON®-Schlauch 3350 3703309 orange-orange 0.89 0.85 3 6 St.
TYGON®-Schlauch 3350 3703310 weiß-weiß 1.02 0.85 3 6 St.
TYGON®-Schlauch 3350 3703215 blau-blau 1.65 0.85 2 6 St.
TYGON®-Schlauch 3350 3703218 violett-schwarz 2.29 0.85 2 6 St.
TYGON®-Schlauch 3350 3703219 violett-orange 2.54 0.85 2 6 St.
TYGON®-Schlauch 3350 3703319 violett-orange 2.54 0.85 3 6 St.